How to keep your cook-top looking brand new? It is tough, much tougher than the glass it resembles. Nevertheless, do not stand on it in order to repair a light and do not drop a heavy object from the top of the kitchen unit above! It is resistant to heat and cold and even to extreme temperature changes. You can pour cold water onto a cooking zone without causing any damage. It is attractive and easy to clean. It will remain so if you take a few precautions and follow our advice. Before using your cook-top, check each time that the bottom of the saucepan and the cooking zone are clean and dry. Lift up the saucepans; sliding them across the cook-top can lead to superficial scratches. Avoid peeling vegetables over the cook-top as this could lead to grit on the surface and subsequent scratching. Use saucepans which are large enough to avoid spillage onto the cook-top, especially if a saucepan contains any sugar as this can cause irreparable damage to the glass ceramic. 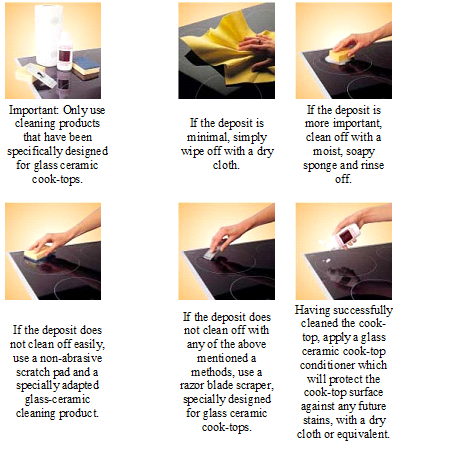 Keep the surface of the cook-top clear; above all do not keep plastic or aluminium packing on it which could melt and damage the cook-top. before the cook-top cools down (Be careful not to burn yourself! ).